We’ve all sewn them, but in this class you will learn how to create them! 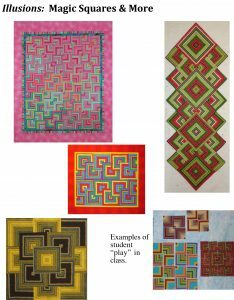 Students will work through a series of exercises to create unique plans for Off Center Log Cabin quilts with all the necessary materials provided. We will also cover using triangle, rectangle, and diamond versions. This is a ‘cut and paste’, ‘paste & color’ play class suitable for everyone. Foundation piecing will be discussed as it is necessary for triangle and diamond projects. The use of non-traditional grids for the drafting of traditional blocks creates the illusion of perspective and depth. 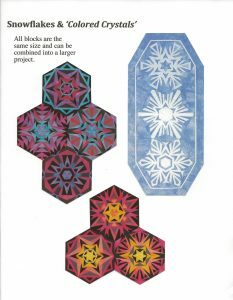 Emphasis will be on using blocks that can be sewn with a ‘sew and flip’ method on freezer paper to eliminate what would otherwise be hundreds of templates. Appropriate for developing wall hanging size pieces. Snowflakes and crystals are sewn in six identical wedge shaped sections on a freezer paper foundation, then joined together. 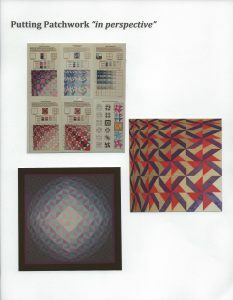 They can simply be blue and white, or become ‘crystals’ by making a color plan for each block. Class will cover making multiple foundations using the needle punch method. 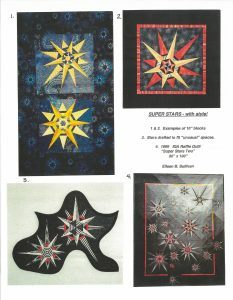 Unusual and unique six pointed ‘off center’ stars are designed and pieced using the foundation method on freezer paper. Class handouts for several 10” blocks will get you started. Emphasis will be on careful color selections to make your blocks reflect your personal color way. Class will also cover how to design your own, any size using a simple ‘Design Core’ handout. Striped fabric transforms into many different configurations using an easy sewing method and a lot of ‘lets try this’ to see what happens. Experimentation brings you results you never expected. 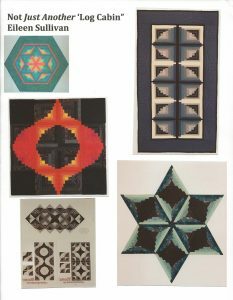 You can use this method to make quick and easy quilts, table runners, placemats, garments or purses and totes. This class covers all the introductory information for foundation piecing. The thrust of the workshop is to develop unique, individual floral gardens from the numerous 4”, 6”, and 6” x 9” blocks given in handouts. Class work will complete several blocks then move on to composition, ‘sew-able’ arrangements, variations and preplanning an entire project. 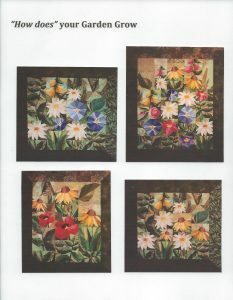 Handouts include all the floral and foliage blocks required as well as a ‘cut up and organize a plan for your individual project. All levels are welcome but a basic understanding of foundation piecing is helpful. Choose from several of the Just For Fun block designs. We will cover all of the basics of foundation piecing, how to correct your mistakes, how to make foundations, etc. This class is specifically designed for those who want to get comfortable with the process. Photos can be seen on the Just For Fun page.